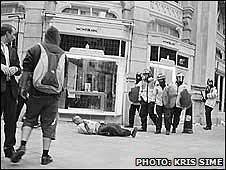 The policing of the G20 summit in London has been called into question after an allegation of manslaughter and another of assault emerged. The Independent Police Complaints Commission is investigating the contact Ian Tomlinson had with police after a second post-mortem examination found that he died of an abdominal haemorrhage. It is also investigating why a woman was struck by an officer. But how did the events unfold? Police warn that activists are planning protests in an "unprecedented" way in the lead up to the summit, with fears anarchist groups from the 1990s will re-emerge. Scotland Yard describes the policing plan as one of the largest, most challenging and complicated public order operations it has ever devised. Senior officers say the force is "up for it and we're up to it." Meanwhile, groups such as the G20 Meltdown and the Climate Camp are busy mobilising protesters using social networking sites. Climate Camp holds a day-long seminar including advice on how best to hold and maintain a space and how to defuse confrontational situations. 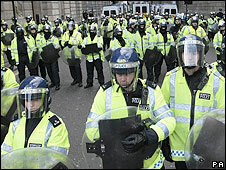 Protesters march on the Bank of England in the City of London, where police use their controversial 'kettling' technique to contain the crowds, which involves protesters being surrounded by officers. 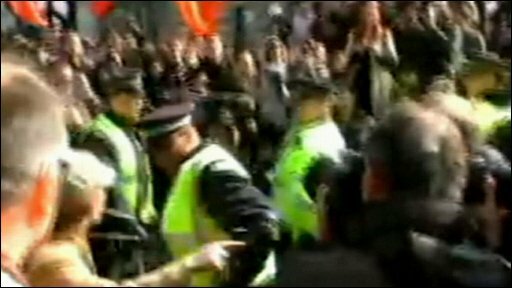 A branch of the Royal Bank of Scotland is stormed, but the protest passes largely peacefully, with sporadic flashes of violence contained by officers. 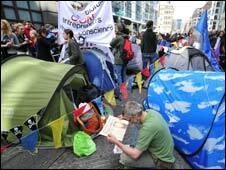 Half a mile away in Bishopsgate, environmental campaigners pitch tents for a Climate Camp - a peaceful protest. Newspaper vendor Ian Tomlinson, 47, who was not involved in the protests but walking home from work, dies after collapsing near the Bank of England, despite attempts by police officers to revive him. The Metropolitan Police release a statement saying officers had been forced to move him as they were being hit with missiles including bottles. The Independent Police Complaints Commission (IPCC) is informed. There are 93 arrests over the course of the day. Further protests outside the Stock Exchange and near the ExCel conference centre are low-key in comparison to 1 April. Meanwhile, complaints about police treatment the previous day start to emerge. Some of the demonstrators in the police "kettle" at the Bank of England are furious, believing they were kept there for hours to be taught a lesson. Police used public order powers to break up the Climate Camp, dragging away protesters who refuse to move. Protesters say the tactics were disproportionate as it had been a peaceful event. City of London Police release a statement saying a post mortem has established Mr Tomlinson suffered a heart attack. A statement reads: "A post-mortem examination found he died of natural causes. "[He] suffered a sudden heart attack while on his way home from work." A group of activists calling themselves G20 Witnesses call for a full public inquiry into Mr Tomlinson's death, saying the IPCC inquiry would not be enough. The IPCC takes over the investigation into Mr Tomlinson's death from the City of London Police as evidence emerges suggesting that he had been in contact with police shortly before his death. CCTV shows police officers refusing to let him through a cordon opposite the Bank of England, prompting him to walk around the corner into Royal Exchange Passage. "A number of witnesses have described seeing him there, getting caught up in a crowd and being pushed back by police officers," IPCC Commissioner for London, Deborah Glass, said. Footage emerges showing Mr Tomlinson being pushed to the ground by a police officer, in what are thought to be the last pictures of him alive. Mr Tomlinson's stepson Paul King says until the family got all the answers and justice "we can't lay our father to rest". Metropolitan Police Commissioner Sir Paul Stephenson says the footage raises "obvious concerns" and the inquiry will receive the full support of the force. 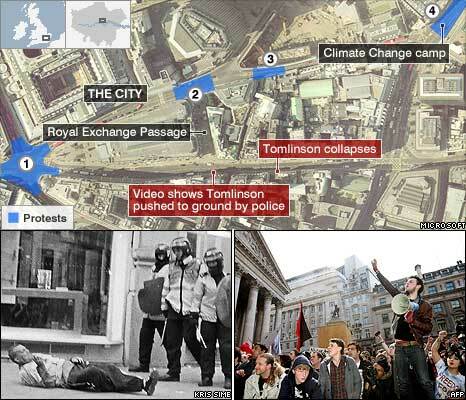 Meanwhile, the police officer thought to be seen pushing Mr Tomlinson in the footage identifies himself to investigators. New footage emerges on Channel 4 which appears to show an officer apparently hitting Mr Tomlinson left-handed with a baton, then shoving him to the ground. Meanwhile, the officer seen apparently pushing him to the ground is suspended from duty. The IPCC announces it will hold an independent criminal investigation into the incident. Footage on YouTube appears to show a woman, Nicky Fisher, 35, from Brighton, East Sussex, being hit in the face by a police officer after swearing at him. He also apparently strikes her on the leg with his baton. The IPCC says it will investigate. 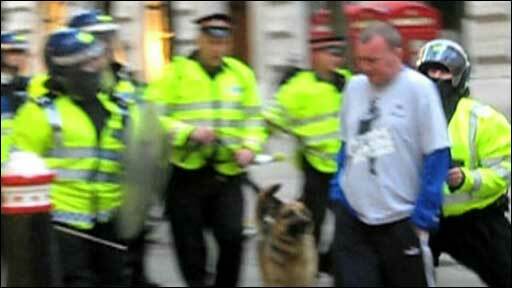 A statement from the Met says the apparent actions of the officer raised "immediate concerns". The police sergeant seen hitting a woman in the face is suspended from duty. Metropolitan Police Commissioner Sir Paul Stephenson announces Her Majesty's Chief Inspector of Constabulary (HMIC) will review policing tactics, including "kettling". Sir Paul said: "I have already expressed my concern that the video footage of some police actions are clearly disturbing and should be thoroughly investigated." A total of 145 complaints have been made following clashes between police and protesters at the G20 summit. They include 70 claims of excessive force by alleged victims or witnesses to brutality, the Independent Police Complaints Commission said. A second post-mortem examination finds Ian Tomlinson died of abdominal haemorrhage, not a heart attack. A Metropolitan police officer has been interviewed under caution for the offence of manslaughter, the IPCC says.